In this exercise, you will use an aerial photograph to create a new point feature representing a park ranger station in Zion National Park. Once the feature is created, you will then add attribute values to the point. You are introduced to the Editor toolbar, the Create Features window, and the Attributes window, which are the main elements of the ArcMap user interface when editing. To start this exercise, you first need to zoom the map to your area of interest. A spatial bookmark, which is similar to a bookmark in a Web browser, is a way to save frequently used locations on your map so you can easily access them. A bookmark has been created for you containing the map extent in which you will be working. This exercise requires an active Internet connection since it uses imagery served from the Web. If you do not have an Internet connection or if the imagery is loading slowly, you can still perform the tutorial using an image that is installed with the tutorial data. You need to turn on the DOQQ imagery (local) layer in the table of contents, then you can turn off the World imagery (Web) layer. Navigate to the Exercise1.mxd map document in the Editing directory where you installed the tutorial data. (C:\ArcGIS\ArcTutor is the default location.) If the Getting Started window opens, choose to browse for an existing map and navigate to Exercise1.mxd. Click the map and click Open. If you are prompted to enable hardware acceleration to improve performance, click Yes. 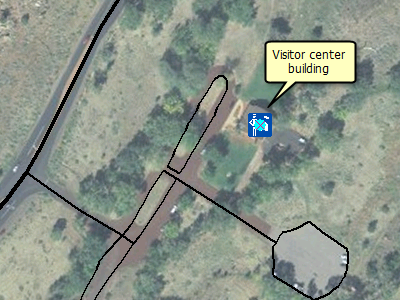 Click the Bookmarks menu and click Visitor center to zoom you to the area around a visitor center ranger station at the south entrance of Zion National Park. Click the Editor menu on the Editor toolbar and click Start Editing. Open the Create Features window by clicking Create Features on the Editor toolbar. 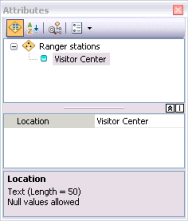 In the Create Features window, click the Ranger stations point feature template. This sets up the editing environment so that you will be creating new point features in the Ranger stations layer. Click the Point tool on the Create Features window. Using the aerial imagery, click the map to place a point directly over the visitor center building in the center of the display. Since you are creating points, clicking the map once adds the feature. If you were drawing lines or polygons, however, you would need to use more than one click so you could create segments in between vertices. Notice that the center of the symbol contains a solid, cyan-colored (light, bright blue) circle. By default, as soon as you create new features when editing, they are selected. This allows you to easily identify the new feature and add attribute values to it. Using the Attributes window is a quick way of updating the attribute values of one or more selected features when you are editing. The top of the window shows a hierarchy of the name of the layer and, underneath it, an identifier for the individual feature from that layer. The bottom of the window shows the field (a column in a table) names and the attribute values (a row in a table) for the feature. Click inside the box for the Location property value, which is currently blank or <Null>. Type Visitor Center and press ENTER. This action stores the attribute values for that feature. Notice that the entry for the feature on the top of the window is no longer a generic number but has been replaced with the more descriptive Visitor Center. To continue to the next exercise, click Exercise 1b: Digitizing lines and snapping. You have now completed the first exercise and created a new point feature. In the next exercises, you will learn how to create new lines and polygons.